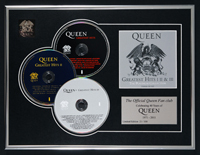 Queen dominate UK's Top 40 bestselling vinyl albums of 2019 so far as fans revisit the band's catalogue following the release of Freddie Mercury biopic Bohemian Rhapsody. Queen + Adam Lambert in Australia! November 6th to 9th 2015. Our THIRTIETH year! It will be bigger and better than ever and back in an old favourite venue - Pontins Southport! display that will grace your walls for many years to come. Please click here to order, you cannot order directly from the Fan Club. The Official International Queen Fan Club | P.O.Box 141 | West Horsley | Surrey KT24 9AS | +44 (0) 1483 281995 Site Powered by: GSL Technologies Inc.